Californian pioneer; born in Ichenhausen, Bavaria, Dec. 17, 1824; died at San Francisco, Cal., Nov. 19, 1902. In 1845 he emigrated to America and proceeded to Louisville, where he began his career as a pedler. There he met Louis Sloss, who afterward became his partner and brother-in-law. 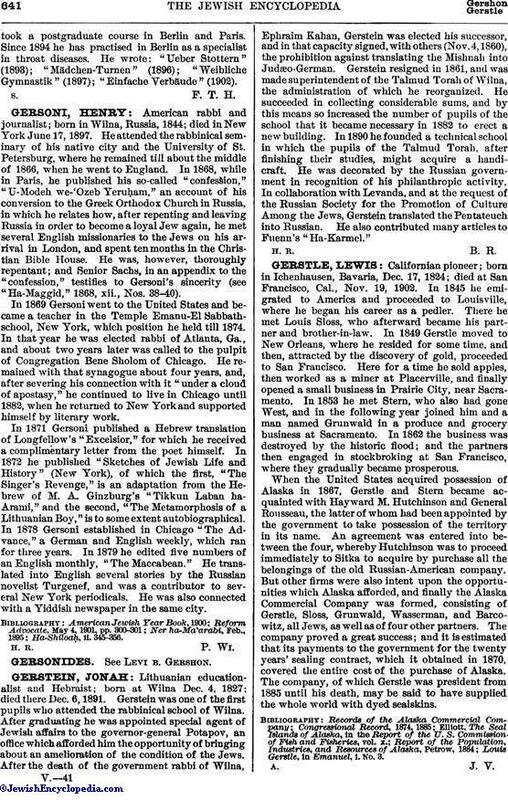 In 1849 Gerstle moved to New Orleans, where he resided for some time, and then, attracted by the discovery of gold, proceeded to San Francisco. Here for a time he sold apples, then worked as a miner at Placerville, and finally opened a small business in Prairie City, near Sacramento. In 1853 he met Stern, who also had gone West, and in the following year joined him and a man named Grunwald in a produce and grocery business at Sacramento. In 1862 the business was destroyed by the historic flood; and the partners then engaged in stockbroking at San Francisco, where they gradually became prosperous. When the United States acquired possession of Alaska in 1867, Gerstle and Stern became acquainted with Hayward M. Hutchinson and General Rousseau, the latter of whom had been appointed by the government to take possession of the territory in its name. An agreement was entered into between the four, whereby Hutchinson was to proceed immediately to Sitka to acquire by purchase all the belongings of the old Russian-American company. But other firms were also intent upon the opportunities which Alaska afforded, and finally the Alaska Commercial Company was formed, consisting of Gerstle, Sloss, Grunwald, Wasserman, and Barcowitz, all Jews, as well as of four other partners. The company proved a great success; and it is estimated that its payments to the government for the twenty years' sealing contract, which it obtained in 1870, covered the entire cost of the purchase of Alaska. The company, of which Gerstle was president from 1885 until his death, may be said to have supplied the whole world with dyed sealskins. Louis Gerstle, in Emanuel, i. No. 3.